"Newspapers.com" and "Fold3" redirect here. For the Wikipedia Library partnerships, see Wikipedia:Newspapers.com and Wikipedia:Fold3. Ancestry.com LLC is a privately held online company based in Lehi, Utah. The largest for-profit genealogy company in the world, it operates a network of genealogical, historical record and genetic genealogy websites. As of November 2018, the company claimed to provide access to approximately 10 billion historical records, to have 3 million paying subscribers and to have sold 14 million DNA kits to customers. In 1990, Paul B. Allen and Dan Taggart, two Brigham Young University graduates, founded Infobases and began offering Latter-day Saints (LDS) publications on floppy disks. In 1988, Allen had worked at Folio Corporation, founded by his brother Curt and his brother-in-law Brad Pelo. Infobases' first products were floppy disks and compact disks sold from the back seat of the founders' car. In 1994, Infobases was named among Inc. magazine's 500 fastest-growing companies. Their first offering on CD was the LDS Collectors Edition, released in April 1995, selling for $299.95, which was offered in an online version in August 1995. Ancestry officially went online with the launch of Ancestry.com in 1996. On January 1, 1997, Infobases' parent company, Western Standard Publishing, purchased Ancestry, Inc., publisher of Ancestry magazine and genealogy books. Western Standard Publishing's CEO was Joe Cannon, one of the principal owners of Geneva Steel. In July 1997, Allen and Taggart purchased Western Standard's interest in Ancestry, Inc. At the time, Brad Pelo was president and CEO of Infobases, and president of Western Standard. Less than six months earlier, he had been president of Folio Corporation, whose digital technology Infobases was using. In March 1997, Folio was sold to Open Market for $45 million. The first public evidence of the change in ownership of Ancestry magazine came with the July/August 1997 issue, which showed a newly reorganized Ancestry, Inc., as its publisher. That issue's masthead also included the first use of the Ancestry.com web address. More growth for Infobases occurred in July 1997, when Ancestry, Inc. purchased Bookcraft, Inc., a publisher of books written by leaders and officers of the LDS Church. Infobases had published many of Bookcraft's books as part of its LDS Collector's Library. Pelo also announced that Ancestry's product line would be greatly expanded in both CDs and online. Alan Ashton, a longtime investor in Infobases and founder of WordPerfect, was its chairman of the board. Allen and Taggart began running Ancestry, Inc. independently from Infobases in July 1997, and began creating one of the largest online subscription-based genealogy database services. In April 1999, to better focus on its Ancestry.com and MyFamily.com Internet businesses, Infobases sold the Bookcraft brand name and its catalog of print books to its major competitor in the LDS book market, Deseret Book. Included in the sale were the rights to Infobases' LDS Collectors Library on CD. A year earlier, Deseret Book had released a competing product called GospeLink, and the two products were combined as a single product by Deseret Book. The MyFamily.com website launched in December 1998, with additional free sites beginning in March 1999. The site generated one million registered users within its first 140 days. The company raised more than US$90 million in venture capital from investors and changed its name on November 17, 1999, from Ancestry.com, Inc. to MyFamily.com, Inc. Its three Internet genealogy sites were then called Ancestry.com, FamilyHistory.com, and MyFamily.com. Sales were about US$62 million for 2002 and US$99 million for 2003. 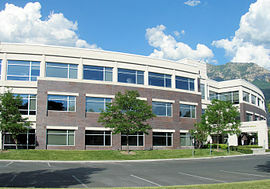 In March 2004, the company, which had outgrown its call center in Orem, Utah, opened a new call center, which accommodates about 700 agents at a time, in Provo. Heritage Makers was acquired by MyFamily.com in September 2005. In 2010, Ancestry sold its book publishing assets to Turner Publishing Company. Ancestry.com became a publicly traded company on NASDAQ (symbol: ACOM) on November 5, 2009, with an initial public offering of 7.4 million shares priced at $13.50 per share, underwritten by Morgan Stanley, Bank of America, Merrill Lynch, Jefferies & Company, Piper Jaffray, and BMO Capital Markets. In 2010, Ancestry.com expanded its domestic operations with the opening of an office in San Francisco, California, staffed with brand new engineering, product, and marketing teams geared toward developing some of Ancestry's cutting-edge technology and services. In 2011, Ancestry launched an Android and iOS app. In December 2011, Ancestry.com moved the Social Security Death Index search behind a paywall and stopped displaying the Social Security information of people who had died within the past 10 years, because of identity theft concerns. In March 2012, Ancestry.com acquired the collection of DNA assets from GeneTree. In September 2012, Ancestry.com expanded its international operations with the opening of its European headquarters in Dublin, Ireland. The Dublin office includes a new call centre for international customers, as well as product, marketing, and engineering teams. In October 2012, Ancestry.com agreed to be acquired by a private equity group consisting of Permira Advisers LLP, members of Ancestry.com's management team, including CEO Tim Sullivan and CFO Howard Hochhauser, and Spectrum Equity, for $32 per share or around $1.6 billion. At the same time, Ancestry.com purchased a photo digitization and sharing service called 1000Memories. On July 16, 2015, Ancestry launched AncestryHealth, and announced the appointment of Cathy A. Petti as its Chief Health Officer. In April 2016 GIC Private Limited (a sovereign wealth fund owned by the Government of Singapore) and Silver Lake (a private equity fund manager) bought equity stakes in Ancestry.com. The estimated market value of Ancestry.com in 2017 was more than $3 billion. In November 2018 Ancestry claimed to have over 10 billion digitised records and over three million paying customers. AncestryDNA is a subsidiary of Ancestry LLC. AncestryDNA offers a direct-to-consumer genealogical DNA test. Consumers provide a sample of their DNA to the company for analysis. AncestryDNA then uses DNA sequences to infer family relationships with other Ancestry DNA users and to provide what it calls an "ethnicity estimate". Previously, Ancestry.com also offered paternal Y-chromosome DNA and maternal mitochondrial DNA tests, but those were discontinued in June 2014. The company describes the technical process of testing in a scientific white paper. In November 2018 the company claimed that, to date they had sold more than 14 million DNA kits to customers. Ancestry DNA is commonly used for donor conceived persons to find their biological siblings and in some cases their sperm or egg donor. The testing itself is performed by Quest Diagnostics. On September 30, 2013, Ancestry.com announced its acquisition of Find a Grave. Site editor Jim Tipton said of the purchase that Ancestry.com had "been linking and driving traffic to the site for several years. Burial information is a wonderful source for people researching their family history". Ancestry.com launched a mobile app in March 2014. RootsWeb, acquired by Ancestry in June 2000, is a free genealogy community that uses online forums, mailing lists, and other resources to help people research their family history. Users can upload GEDCOM files of their information for others to search at the WorldConnect portion of the site. Trees uploaded to WorldConnect are searchable at both the RootsWeb and Ancestry websites. On December 20, 2017, a file containing 300,000 RootsWeb user names, passwords, and email addresses was exposed to the internet. The 300,000 records were from RootsWeb surname list service with 55,000 of those records were also Ancestry.com login credentials. In 2012, Ancestry spun off its digitized online newspaper components into a standalone service Newspapers.com with newspaper.com only pricing as well as a bundled Ancestry.com pricing. iArchives, Inc. (and its footnote.com service) acquired in 2010 for 1.022 million Common Stock shares. The purchase brought in assets including processes for digitalizing documents on microfilm. Footnote would be rebranded Fold3 in 2011. Archives.com acquired for $100 million in 2012. As of June 30, 2018 the archive claimed its index comprised online newspapers dating from 1700 worldwide, covering 8,600+ newspapers, a total of 394,957,981 pages. The website's principal competitor is newspaperarchive.com which claims it has online newspapers dating from 1607 worldwide and its index in June 2018 includes 9,829 newspapers. Both websites having similar models for increasing their databases: striking deals with libraries, publishers and historical organizations to scan the publications for free to include in their database. Participants note that the process of free scanning is easier, cheaper and quicker to get their publications online rather than working through the government operated National Digital Newspaper Program. ROOTS software series by CommSoft was one of the first publishers of series of genealogy software programs, created in the 1980s, and available until 1997. Commsoft released the following, ROOTS89 for the Heath H-8 series of personal computers, ROOTS/M for the CP/M operating system, ROOTS II for MS-DOS, followed by ROOTS III and ROOTS IV. The company also released ROOTS V for Windows along with Visual ROOTS for Microsoft Windows. Family Tree Maker, sold in 2017. Genealogy.com - Genealogy.com maintains a genealogy research website. Genealogy.com was acquired subsequently by MyFamily.com in 2003. MyFamily.com - allowed members to create private family, or group, websites. Also in May 2010, MyFamily closed its Bellevue, Washington, development office, effectively letting its entire staff go since the offer to move to Provo was not accepted by any staff. Ancestry shut down MyFamily.com on September 5, 2014. At the shutdown, MyFamily had not resolved discontent with the downloading process, which consisted of capturing miscellaneous uncatalogued photos, with alphanumeric names and no data attached, and various calendar documents, thus leaving behind the associated data, File Cabinet documents, family recipes, and all other information. In 2015, Ancestry partnered with Calico, a subsidiary of Google, to focus on longevity research and therapeutics, in an effort to investigate human heredity of lifespan. After the arrest of the accused Golden State Killer Ancestry.com along with 23andMe made a data policy that says that it won't allow its DNA profiles to be used for crime solving unless pressured to do so by law enforcement as it believes it violates users' privacy despite the fact that the sites database was used in 2017 to solve the Murder of Jane Britton. ^ "Ancestry Names Margo Georgiadis Chief Executive Officer". ^ Goodman, Wes. "GIC and Silver Lake Invest in U.S. Genealogy Company Ancestry". Bloomberg. Retrieved April 8, 2016. ^ "NaviSite". Santa Cruz Sentinel. May 9, 1999. p. D3. Retrieved February 26, 2017 – via Newspapers.com. ^ Walker, Joseph (June 11, 2000). "Backing into a lucrative business". Deseret News. Retrieved February 26, 2017. ^ "Let a mouse guide your scripture search". Deseret News. April 3, 1995. ^ "LDS Materials Available Online". Deseret News. August 3, 1995. ^ "Ancestry Moves Further into Consumer Genetics". MIT Technology Review. Retrieved May 11, 2016. ^ "About Western Standard Publishing". Archived from the original on June 16, 2008. Retrieved September 21, 2008. ^ "Genealogy business booms as boomers seek out roots". Deseret News. April 5, 1997. ^ "Western Standard sells interest in business magazine to Utah County man". Deseret News. June 4, 1997. ^ "Infobases acquires LDS publishing house". Deseret News. July 1, 1997. ^ "Happily joined". Deseret News. April 5, 1998. ^ a b c "Infobase Ventures Portfolio Companies". Infobase Ventures. Archived from the original on May 28, 2007. Retrieved April 21, 2008. ^ "Deseret Book parent announces plans to acquire Bookcraft". Deseret News. February 9, 1999. ^ "Acquisition of Bookcraft finalized". Deseret News. April 1, 1999. ^ "MyFamily.com begins offering free sites". March 11, 1999. Archived from the original on November 16, 2006. Retrieved December 26, 2006. ^ "Ancestry.com, Inc. Changes Corporate Name to MyFamily.com, Inc". Ancestry.com. November 17, 1999. ^ Paul Allen (May 20, 2006). "My Companies: A Chronological View of My Entrepreneurial Endeavors". paulallen.net. Archived from the original on April 18, 2008. Retrieved April 21, 2008. ^ "MyFamily growing in Utah". Deseret News. April 13, 2004. Archived from the original on April 21, 2008. Retrieved April 21, 2008. ^ "MyFamily.com, Inc. Acquires Heritage Makers". PR Newswire. September 21, 2005. Archived from the original on January 27, 2006. Retrieved April 21, 2008. ^ Jim Milliot, "Turner Publishing Buys Ancestry Publishing Assets," Publishers Weekly, March 23, 2010. ^ "Ancestry.com explores an IPO". BloggingStocks.com. Retrieved February 27, 2011. ^ "Ancestry.com updates app with iPad optimization". Macworld. Retrieved May 11, 2016. ^ "Ancestry app is the perfect companion for researching family tree history". AndroidTapp. March 5, 2012. Retrieved May 11, 2016. ^ Sterman, Joce (December 14, 2011). "Website stops displaying Social Security numbers for recently dead". ABC2. Archived from the original on January 10, 2012. Retrieved December 21, 2011. ^ Kennedy, John Fintan (July 11, 2012). "Ancestry.com to create 50 new jobs at international HQ in Dublin". Silicon Republic. Retrieved August 1, 2013. Ancestry.com’s Dublin employees will include staff working within management and finance functions, as well as website developers and member service agents. ^ Flanagan, Peter (October 23, 2012). "Genealogy giant sold for €1.2bn months after Dublin move". Irish Independent. Retrieved August 1, 2013. It set up in Ireland last year but in July confirmed it would open its European headquarters on Sir John Rogerson's Quay in Dublin, and started taking on around 35 staff from September. ^ "Ancestry.com Acquired by Private Equity Group for $1.6 Billion". The Descrier. Retrieved October 22, 2012. ^ "Ancestry.com Acquires Photo Digitization And Sharing Service 1000memories". TechCrunch. Retrieved October 3, 2012. ^ "Ancestry.com launches health website, positions itself as budding 23andMe competitor". MobiHealthNews. July 16, 2015. Retrieved May 11, 2016. ^ Or, Amy (April 5, 2016). "Permira trebles money by selling Ancestry stake to Silver Lake, GIC". Financial News. Retrieved May 31, 2018. ^ Porter, Keil; Sherman, Alex (July 19, 2017). "Ancestry.com Is Close to Hiring Banks for 2017 IPO". Bloomberg.com. Retrieved May 31, 2018. ^ a b Spatafore, Gina (2018-11-29). "Ancestry Breaks November Sales Record". Business Wire. Retrieved 2018-11-30. ^ "23andme relaunches its expanded DNA spit tests after FDA-mandated pause". USA TODAY. Retrieved May 11, 2016. ^ "Ancestry.com Pulls the Plug on Several Sites". Archived from the original on July 15, 2014. Retrieved July 15, 2014. ^ Regalado, Antonio (February 12, 2018). "2017 was the year consumer DNA testing blew up". MIT Technology Review. Retrieved February 20, 2018. ^ Chung, Emily; Glanz, Melanie; Jan 25, Vik Adhopia · CBC News · Posted:; Last Updated: August 20, 2018 5:00 AM ET; 2018. "No more Mr. Anonymous for sperm donors - CBC News". CBC. ^ "AncestryDNA Uses Quest Diagnostics to Sequence DNA | Dark Daily". www.darkdaily.com. Retrieved 2018-11-14. ^ "The Ancestry Insider: Ancestry.com Releases Find-A-Grave App". www.ancestryinsider.org. Retrieved May 18, 2016. ^ "Exposed File From Ancestry's RootsWeb.com Contains Data on 300,000 Users". Dark Reading. Retrieved December 28, 2017. ^ "Ancestry.com and Footnote.com". October 21, 2010. Retrieved January 16, 2019. ^ "Ancestry.com Inc. Completes Acquisition of iArchives - Business - Press Releases". NBC News. October 21, 2010. Retrieved April 4, 2018. ^ "More on Ancestry.com's Acquisition of Footnote". September 23, 2010. ^ Author Kate Theimer (August 19, 2011). "News: Footnote is now Fold3. Does that make sense to you? Me neither. And we're not alone – ArchivesNext". Archivesnext.com. Retrieved April 4, 2018. ^ "Ancestry.com Acquires Archives.com For $100 Million – TechCrunch". Techcrunch.com. April 25, 2012. Retrieved April 4, 2018. ^ "Home page". newspapers.com. Ancestry. Retrieved June 30, 2018. ^ "NewspaperArchive® | Genealogy & Family History Records". Newspaperarchive.com. Retrieved June 30, 2018. ^ Jim Epstein (May 18, 2014). "A Retiree Digitizes 27 Million Old Newspaper Pages in His Living Room (and Libraries Fight to Catch Up) - Hit & Run". Reason.com. Retrieved March 31, 2018. ^ Inc, Ancestry. "Ancestry magazine". Ancestry Inc – via Google Books. ^ Family Origins Newsletter, "This will probably be the last issue of the Family Origins newsletter (I hear a lot of you saying 'I thought you stopped writing it a long time ago.' <g>). As many of you know, we (FormalSoft) have been working on a new genealogy program called RootsMagic which we released in February 2002. Many of you have been using Family Origins since we first licensed it to Parsons Technology over 12 years ago. You have gone through all the company changes with us (Parsons, Intuit, Broderbund, The Learning Co., Mattel, Genealogy.com)...As of January 2003, Genealogy.com has discontinued our Family Origins program..."
^ a b Ultimate Family Tree (UFT), by Palladium Interactive, Inc.
^ "Acquisition of Genealogy.com". April 18, 2003. Archived from the original on April 14, 2006. Retrieved December 26, 2006. ^ Christian, Jon (April 23, 2015). "Deleting the Family Tree". Slate. ISSN 1091-2339. Retrieved May 18, 2016. ^ Ramsey, Lydia (July 22, 2015). "Google is on a mission to figure out how and why we age". Business Insider. Retrieved May 31, 2018. ^ Bergen, Mark (July 26, 2015). "The Long Game: Google-Backed Calico Partners With Ancestry to Beat the Specter of Aging". Recode. Retrieved May 18, 2016. ^ Elfin, Dana A. "DNA Testing? You Might Want to Wait for More Legal Protection". news.bloomberglaw.com. ^ "Deleting Consumer DNA from the Internet - Dark Daily". This page was last edited on 12 March 2019, at 20:20 (UTC).